Delicious grilled peaches topped with greek yogurt and honey. Preheat grill to medium heat. Wash and cut the peaches in half and take pitt out. In a small bowl mix together coconut butter, stevia, and cinnamon. 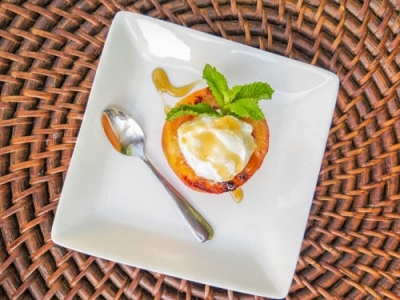 Brush on coconut butter mixture onto each peach half and place skin side up on the grill. Grill until each half has a nice char, about 3-4 minutes. Enjoy topped with Greek yogurt and drizzle with honey!